When considering the dust-free cleaning of small and medium-sized areas, you can’t do better than the KS32R. It works according to the over-throwing principle, which ensures the hopper is filled to capacity. This promotes uninterrupted work and a constant, first-class sweeping performance. To ensure the machine continues to provide consistent cleaning results, the filter in the insert can be shaken clean. 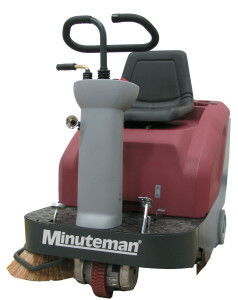 The robust, steel frame construction is heavy-duty quality, which means the Minuteman Kleen Sweep 32R is a machine for professional use that can clean surfaces thoroughly and efficiently. The Kleen Sweep 32R offers operators simple conveniences such as maintenance-free batteries, on-board charging station, wet sweep bypass, large hopper capacity and quiet operation.